Many of you are probably aware football defensive great, Reggie White, died recently. What many do not know is that the man know as a the "Minister of Defense" was a mighty man of G-d, and a Messianic Believer. While listening to Fox News as they announced Reggie's death, they mentioned that in his final years he had been studying Judaism. This statement probably confused many as they knew him as a fiery Baptist Preacher who tackled controversial issues like he tackled quarterbacks, head-on, from the Word of G-d.
During Reggie's last year in football, one of His friends had given him a teaching on Torah by Monte Judah. This teaching open Reggie's eyes to the mighty Hebrew Roots of Scripture and lead to study both Torah and Hebrew. According to Reggie, it opened his eyes to see Scripture as never before. Please pray for Reggie's family and friends as they struggle with his loss. Below is Monte Judah's Web Posting. 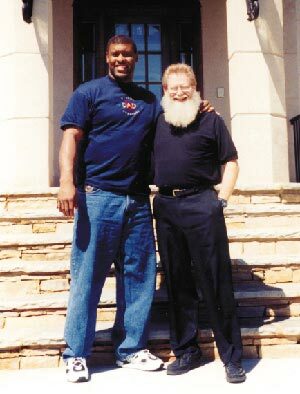 On December 26, 2004 my friend and brother in the faith Reggie White died. Reggie was best known in the world of professional football. He was a defensive end and until this last year had the NFL record for quarterback sacks at 198. There are some who say that Reggie was the greatest defensive player in the history of the game. Reggie was known as the Minister of Defense and was open about his Christian testimony. He was controversial and took issue with the social ills of abortion, homosexuality, and the treatment of the black minorities. In recent years, people began to notice that there was a change in his testimony and faith. He no longer wanted to play the role as attention getter for churches because of his football career. He wanted to be known more as a man of God. How did I know of him? In his final year as a player, some of Reggie’s friends gave him my teaching tape set Introduction to Torah. According to him, it opened his eyes to see Scripture as never before. We agreed to meet after he retired and the football season was over. I stayed as a guest in his home and came to know his wife and two children. When I shook his hand, it felt like sticking my hand in a catcher’s mitt. When he hugged me, he had to bend over. His size made me feel like a little boy. Reggie began to grow in his Messianic faith. He studied Hebrew and the Torah. I didn’t have as much time with him as I wanted, but his friendship was genuine and real. Why would God take him home so early, just as he was emerging as a man of God more than the football great? Some men have great testimonies of God in life. But, men of God have even greater testimonies after death. Reggie’s testimony is just starting to become known. Please pray for Reggie’s wife, Sara, and his two children, Jeremy and Jecolia.